The koshtha deities are not placed inside the koshthas instead are found placed on the ground beneath it. The bas-relief sculptures of Muruga, Dakshinamurti and a much worn-out sculpture are found beneath the koshthas of north, south and east respectively. 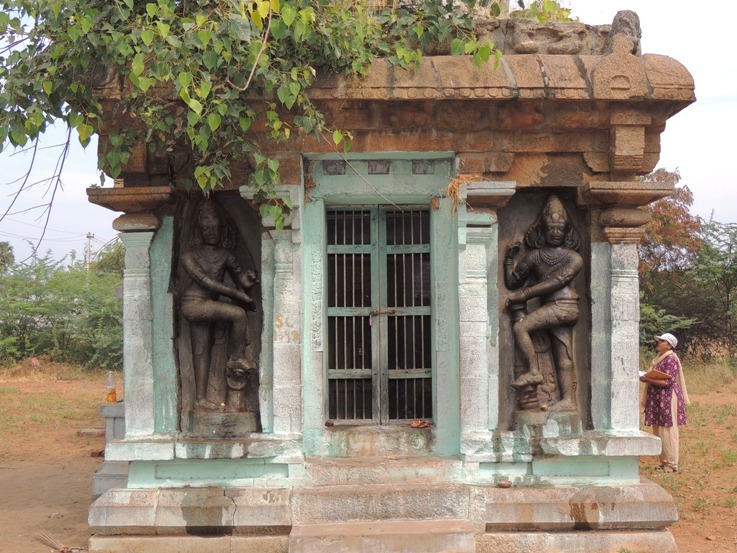 Dvarapalas adorn the entrance. Besides, Ganesa and one of the saptamatha assemblage, Maheswari are found inside the mukha mandapa. A nandi is seen placed in front of the temple in the open space facing the sanctum. Few sculptures are found scattered in the open space viz., Muruga, Ganesa, Virabhadra, Vaishnavi, Varahi, Brahmi, Kaumari, Chamundi. These sculptures are half buried in the soil and also much worn-out. 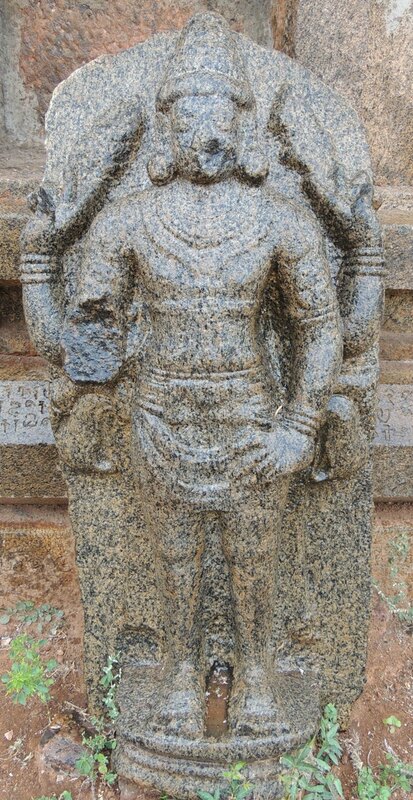 Dakshinamurthi is much damaged below the waist. The deity is seated under a tree, his front hands are damaged whereas his back hands are in kataka and carrying akshamala in the right and fire in the left. His locks are arranged as jatamandala; each braid is formed as ringlet in the tip and the head ornament adorns the hair dressing. Chavadi and beaded mala are the ornaments around the neck, makara kundalas in the right ear and a small patrakundala in the left ear. Both the hands are decked with bangles and armlets and udarabandha little above the abdomen. Yajnopavita is worn in upavita fashion. The branches of the tree are shown spreading above the head of the God and animals are shown active; a lizard is sliding down from the top branch and a squirrel is seen in the middle branch with its tail raised up. Muruga is standing in sama on a padma pedestal with his front right hand in abhaya and front left hand in katyavalambita. His back hands are folded up and in kartari mudra carrying the sakti in the left and vajra in the right. A short attire drape his lower body, secured by the hip belt, besides, idaikattu is worn above it. Heavy knots of the idaikattu are spreading on the sides to which the tussles are extending upto the ankle. Karanda makuta and chenni adorns his head, bangles, armlets, charapali, chhannavira, udarabandha, patrakundalas are the ornaments adorned by him. His front right hand and face are slightly mutilated. An inscription (ARE 204 of 1917) on southern pilaster adjacent to the southern Dvarapala speaks that certain Nirttalaivayan Tenunikaman Eluvan alias Tevanaganapalli Araiyan caused to be made the images of Dvarapalas in Thirunombalur Azhalwar. Both the dvarapalas are standing on a pedestal facing straight, though their body above the waist is facing straight, their lower body is twisted in profile. While their inner leg is placed in parsva on the pedestal, their outer leg is lifted up and rested on the machete of the club that placed adjoining the entrance. 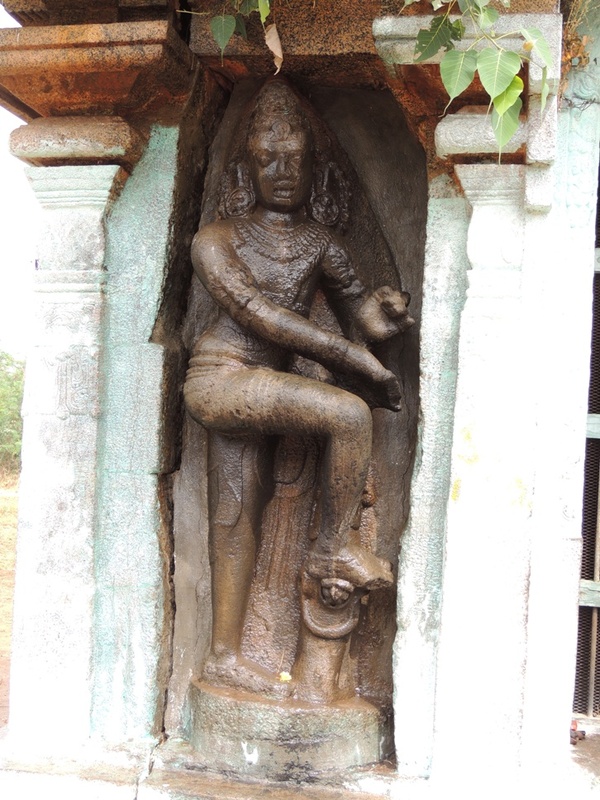 The dvarapala on the south is holding a mace whereas his counterpart is holding a tree branch. The tree branch is entwined by snakes, one of the snake is shown peeping out of a hole and a bird is shown peeping out of another hole. A snake that peeps out of a hole in the branch forms a raised hood, the foot rest to the dvarapala. Their outer hand is twisted towards inner side and placed on their club whereas their inner hand is folded and in kataka mudra. The southern dvarapala is folding his inner hand upright whereas his counterpart is folding towards his chest. Rings, bangles and kirtimukha armlets adorn their hands. kandigai, chavadi and stone studded hara are the ornaments around their neck, besides garland (thFkhiy) spread in the shoulders. Ears are elongated and adorned with swan kundala on the right and owl kundala on the left. Udarabandha is visible in the northern dvarapala. Both are adorned with karandamakuta apart from that a tuft of hair in the lower head is left untied spreading like a jatabhara. Their forehead is decked with head band. Both are wearing salangai in their ankle. Both are wearing a short attire around their waist and a idaikattu is slackly worn above it for which the tussles are spreading around. A thick ornamental yajnopavita is worn in upavita fashion. The bhutas shown in the valabhi are interesting and noteworthy. 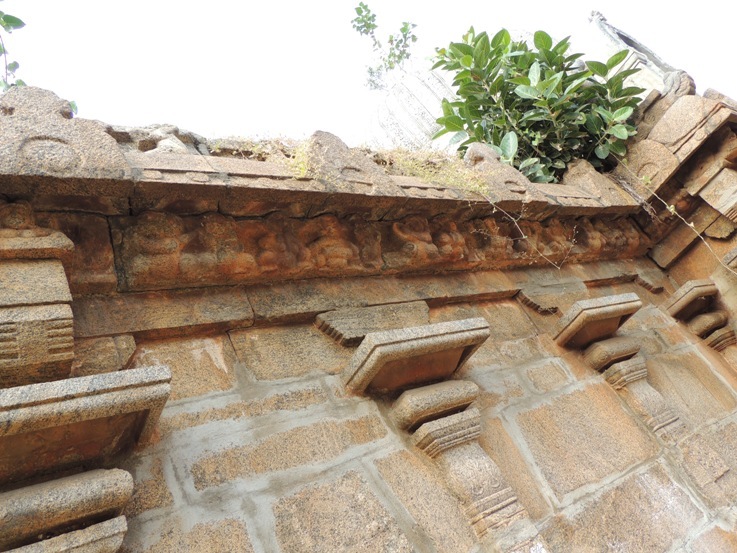 The bhuta frieze runs to the entire stretch of valabhi covering both the vimana and mukha mandapa. Both male and female ganas are shown. The ganas are vibrant and active either frisking the neighbour or animals or in the gesture of elation or handling instruments. Some are in the pose of conversing each other. Ganesa and Linga are also shown in between. Most of the ganas are shown handling instruments. Idakkai, sirattaikinnari, mattalam, thalam, conch and flute are the instruments handled by them. At most instances the ganas handling these instruments are shown continuously. Ganas worshipping Linga is also shown on all the sides. The Linga is shown projecting out prominently with a square avudaiyar and rudra bana. Ganas are also shown frolicking with animals viz., monkeys, tortoise, snakes, makaras are the animals shown in between. Most of the female ganas are hands raised up or on sides in the gesture of dancing to the tunes of their male counterpart. On the northern side it is interesting to note a male gana is on a serious converse with a female gana by holding her hand. Two female ganas are in the gesture of chatting one explaining with her hands raised and the other one curiously listening to her. The ganas are adorned with short attire, kundalas, charapali, bangles, armlets, udarabandha and yajnopavita. The potikas in the corners are four limbed in which two limbs protrudes; the valabhi above the protrusions are depicted with reclining ganas and the space in between the protrusions are filled with squatting simhas with their limbs placed on the vajana above the projected potikas. The reclining ganas are frisking with the neighbor or with snakes. 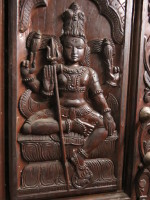 The god is seated in lalitasana on a padma pedestal with the front hands carrying motaka and the back hands carry akshamala in the right and broken tusk in the left. Bangles, armlets, charapali, udarabandha are the ornaments adorn by the God besides karanda makuta adorns his head. 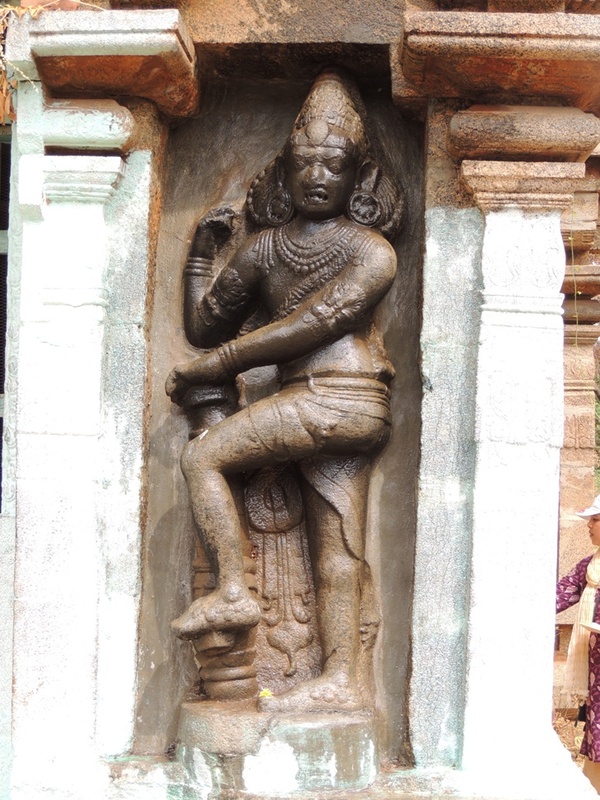 The deity is decked with short attire around the waist and the idaikattu is slackly worn above it. It is interesting to note chhannavira adorn by Ganesa.